Employers have several options for gaining face-to-face time with Kelley students in order to recruit qualified graduating candidates or to volunteer valuable experience to current students. 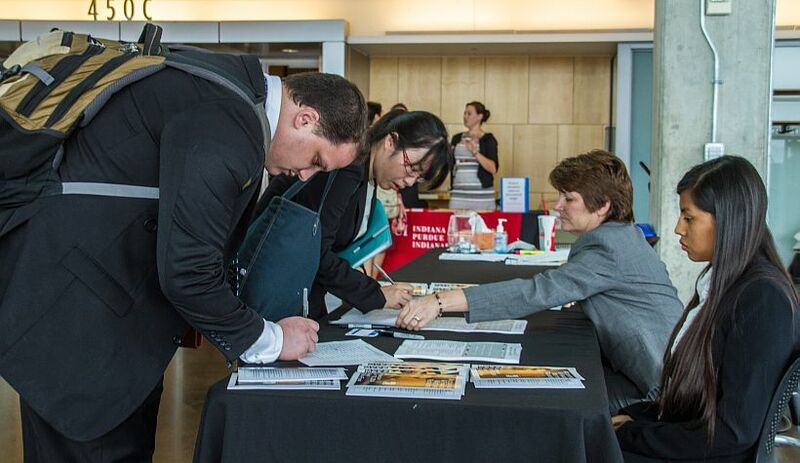 Kelley Indianapolis hosts a variety of career fairs throughout the academic year. These are ideal settings for employers to connect with qualified, talented and diverse candidates to discuss internships and full-time openings within their companies. Information sessions are an ideal way to connect with interested students and to discuss current opportunities, including internships and full-time positions. We can assist you in preparing for and conducting an information session so you can educate students about your company. These typically include a presentation from the employer and a Q&A session. Use your professional experience to guide a student through one of the job search's most important elements: the interview. We arrange and schedule traditional and online mock interviews here on campus or at your office to help students prepare for the real thing. Create an account on our free jobs database, KelleyCareers, to set up a free profile and request your mock interview date. Do you have something to say to today's business students? Join our panel discussions and provide crucial advice to people just starting out or changing careers. Panel discussions are popular events and an excellent way for you to share your own experiences while boosting the profile of your organization. These events feature recruiters and others who actively participate in the hiring process, because most questions relate to job search strategies. We'll arrange a time and place for you to interview Kelley students for internships and/or full-time positions. Create an account on our free jobs database, KelleyCareers, to set up a free profile and request your on-campus interview date. Students want to hear from someone in the business. There are many ways for you to volunteer your time. Review résumés, speak in a career-planning course, participate as a featured company in an I-Core project or provide internship opportunities. Let us know how you want be involved with the next generation of business leaders by contacting us via email, kics@iupui.edu. Use the following form to plan your campus visit and indicate the options and events you're interested in. Join us on campus by contacting Kelley Indianapolis Career Services to schedule your next recruiting event. Email or call to schedule an on-campus opportunity.